There is no rational response to death. That’s especially true when it occurs on a scale as unfathomable as the destruction of Dresden, Germany, in 1945, when British and American warplanes dropped enough explosives on the city to reduce it to rubble and kill at least 25,000 people. The bombing was one of the greatest tragedies in the history of warfare. That Kurt Vonnegut was there to witness it, and later to transmute that experience into a clear meditation on the human propensity for violence in his masterpiece “Slaughterhouse-Five,” was one of the more oddly fortuitous events in the history of American literature. 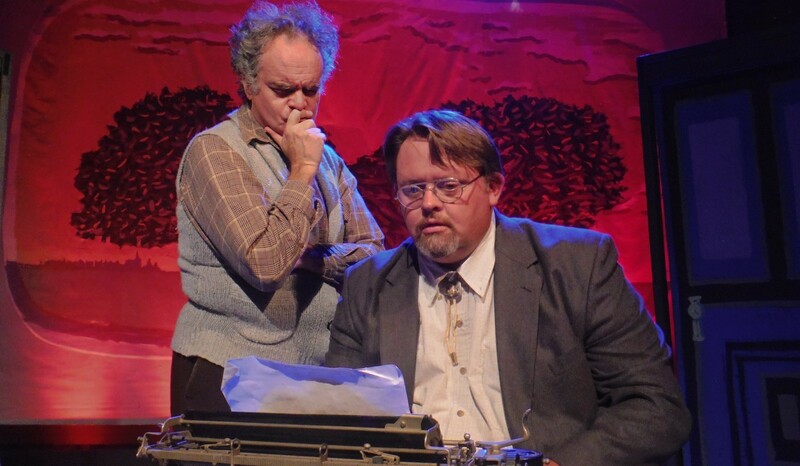 And so it sort of went Thursday in the sweltering Manny Fried Playhouse, when the Subversive Theatre Company opened its 13th season with a production of Eric Simonson’s scattershot adaptation of the book. While the adaptation includes most of the book’s key passages and attempts to strike a smart balance between its clear-eyed observations and absurdist inventions of protagonist Billy Pilgrim, the freight-train force and stunning economy of Vonnegut’s slim volume struggles to survive the conventions of theater. Much of the humor, mercifully, comes through. That struggle is sometimes further complicated by this production, directed by Michael Lodick on a simple and effective set by Tim Lane, which ties down the imagination with a few too many bells and whistles. Speeches by the appealing Tim Joyce as the tale’s narrator are obscured, sometimes by unnecessary crowd noises pumped through the sound system and sometimes by the yammering of actors who ought to be miming their ancillary actions rather than loudly acting them out. There are a few bright spots in this otherwise medium-wattage production. One is Joyce’s wizened and wide-eyed rendering of the Man, which captivates from the very outset and is sure to improve with time as Joyce stops searching the ceiling for his lines. Another is John Kennedy’s performance as Pilgrim, which he portrays as a kind of bumbling Zen master, supremely confident that the lessons he has learned from his interstellar journey to the enlightened alien society of Tralfamadore are the gospel truth. Fine performances also come from Shayne Zimmerman as young Pilgrim, along with Rick Lattimer, Brittany Gabryel and Michael Breen as a variety of characters. But the acting elsewhere is quite uneven, which has the effect of pulling the audience far too often out of the moment in a story that is all about living inside it. One of the great lessons embedded in “Slaughterhouse-Five,” aside from the implicit statement it makes about the inexpressible absurdity of war, is its unlikely undercurrent of optimism. Pilgrim, driven to the edge of his own sanity by his experience in Dresden, can only process the terror he has witnessed by inventing a fictitious society that sees time from all directions. He comes to terms with that horror via quantum physics, which views death not as a permanent condition but as one in a series of infinite moments. This perspective therefore allows him to focus on the good things in life. Pilgrim’s is a worldview, Vonnegut and his theatrical acolytes at Subversive seem to suggest, that need not be precipitated by acts of incredible violence. In Vonnegut’s book, it’s a moment you wouldn’t mind staying trapped in for a while. At Subversive, where the stifling condition of theater adds one too many distractions to an already overstuffed production, two hours seems a tad too much.